Great for home and office decoration! 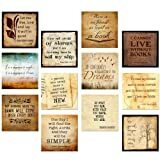 Classic Quotes Motivational Poster Set. Discount Classroom Bundle Featuring Thoreau, Jefferson, Wilde, Dickinson, Poe and more.